This entry was posted in Billing, Rating. Bookmark the permalink. hi ,really appreciable work.. we are using bscs for billing.if u hv an idea then could u pls let me know the various parameters to smooth rating cycle run.thx in adv. 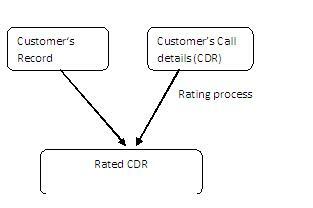 in BSCS for rating cycle you have to check RIH(rate input handler) process for rating. before RIH there is process call PRIH , check the same at server level and DB level to ensure that records in corresponding table updated timely.also check for disk space(error you will get :out of memory).swap space(like some time you got error like fork:cant initialize process). Can tell me where this CDR database is maintained as customer database is maintained in HSS(some subscriber server) ..
CDR database also maintained by operator at their server.we get CDR’s from network elements like MSC,IN and after filtering CDR through mediation we kept in CDR DB. Got from this sight. Thanks. We and our few friends are intending to make a group under one service provider company. what are the rating engines we used generally? Can you tell me difference between rating, charging and billing ?